Voted the most popular Italian sportsman of the twentieth century, Fausto Angelo Coppi was the campionissimo - champion of cycling champions. The greatest cyclist of the immediate postwar years, Coppi's scandalous divorce and controversial death convulsed Italy in the 1950s and were still making headlines half a century later. 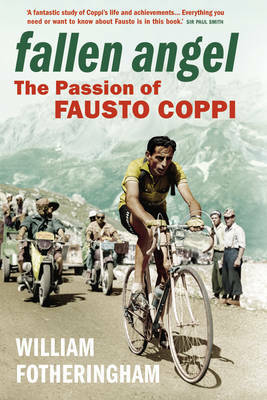 In "Fallen Angel", William Fotheringham, author of the definitive biography of Tom Simpson, tells Coppi's story for the first time for an English-speaking audience. Coppi was the first man to win cycling's great double, the Tour de France and Tour of Italy in the same year - and he did it twice. He achieved mythical status for his crushing solo victories, world titles and world records. His epic rivalry with Gino Bartali divided Italian opinion for a decade. But his significance extends far beyond his sport. Coppi's divorce remains a landmark case in Italy's shift away from the church. In the 1950s, adultery in Italy was still a criminal offence, punishable by up to a year in prison. Coppi and his lover, the 'White Lady' Giulia Occhini, both married with children, were dragged from their beds in the middle of the night. They were excommunicated, and a clamorous legal battle followed. The 'White Lady' was forced to leave the country; Coppi himself died aged just forty, from malaria contracted during an insignificant race in Africa. "Fallen Angel" tells the story of Coppi's tragic life and death, of how a man who became the symbol of a nation's rebirth after the disasters of war died reviled and heartbroken. It is a unique portrait of Italy and Italian sport at a time of tumultuous social change.